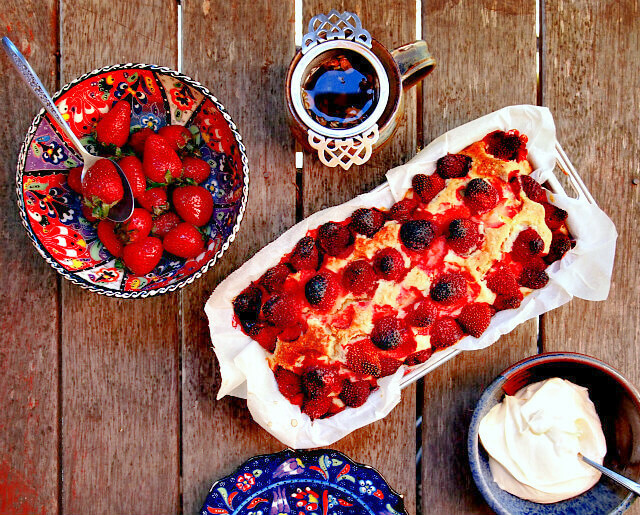 I do love a good tea bread, tender and fragrant, and this strawberry tea bread with almond cream cheese filling is not only delicious, it’s like a danish from heaven. 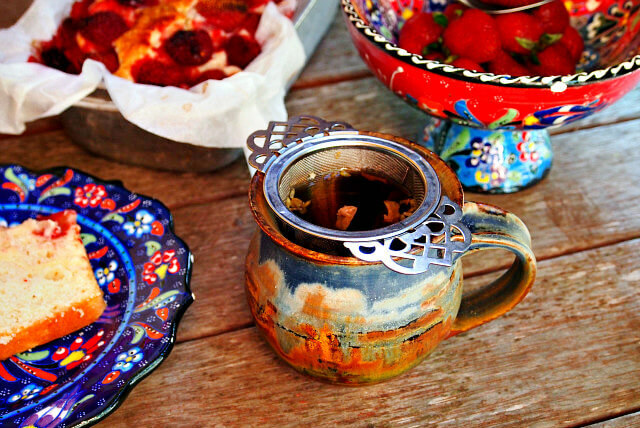 Made with a rich, buttery dough laced with cinnamon, this tea bread is layered with a ribbon of decadent almond cream cheese filling and topped with luscious ripe strawberries. It is a lovely thing to serve for afternoon or morning tea, and it’s not too sweet, so a slice before bed time would not go amiss. Strawberry cream cheese tea bread is also a taste of summer in the middle of winter, highlighting the goodness of strawberries whose flavor is intensified through the baking process. 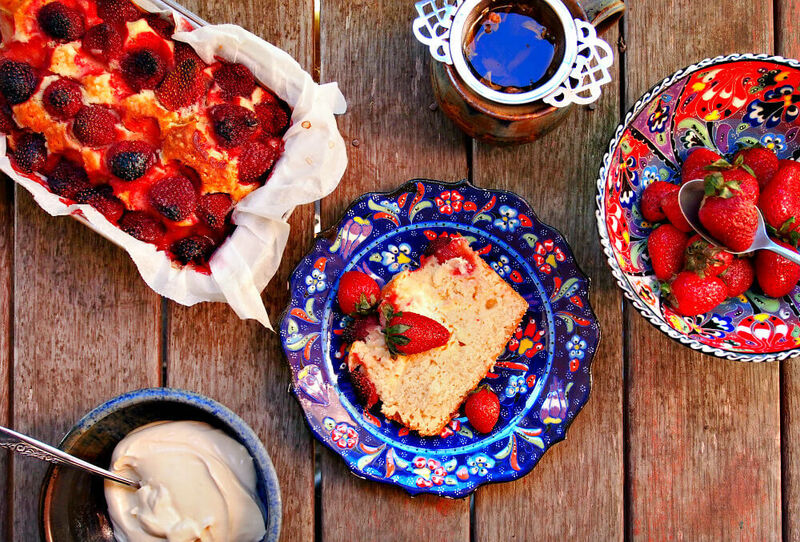 We also used strawberries in our Old Fashioned Strawberry Buckle Cake, and it worked a treat. If you love fruity tea breads, you might give our Citrus and Cardamom Grapefruit Bread a try, or skip fruit altogether and go straight to spicy goodness with our Homemade Spice Cake Recipe with Cream Cheese Frosting . 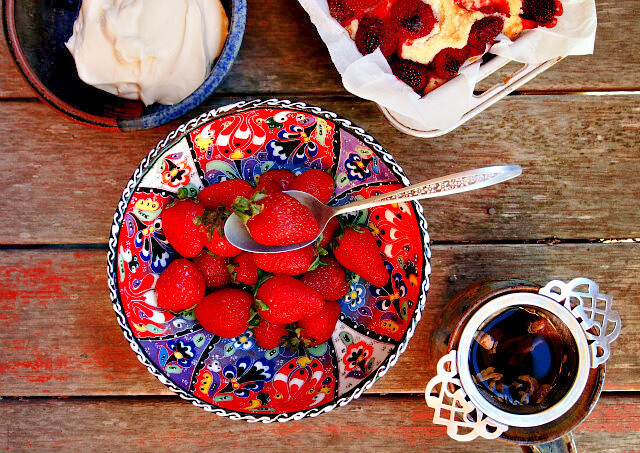 Strawberry, Almond, and Cream Cheese, Oh My! This lovely tea bread is prepared best with the use of fresh strawberries that hold their shape while baking, but, if you can’t find any in cold, dark January, use frozen ones instead. Let them thaw before using, and stir in a drizzle of honey, real maple syrup, or a dusting of powdered sugar to enhance their natural sweetness. Then line them up on top of the tea bread and chop up a few more berries to fold into the batter for extra strawberry deliciousness. The batter is a simple one without any nuts, fruit, or chocolate, but it is good. Butter is essential in this batter; the flavor simply can’t be beat. You could stick to plain vanilla extract with this bread, but I added a generous spoonful of almond extract and a sprinkling of cinnamon. Both of these are warming flavors and pair beautifully with the strawberries and buttery batter. 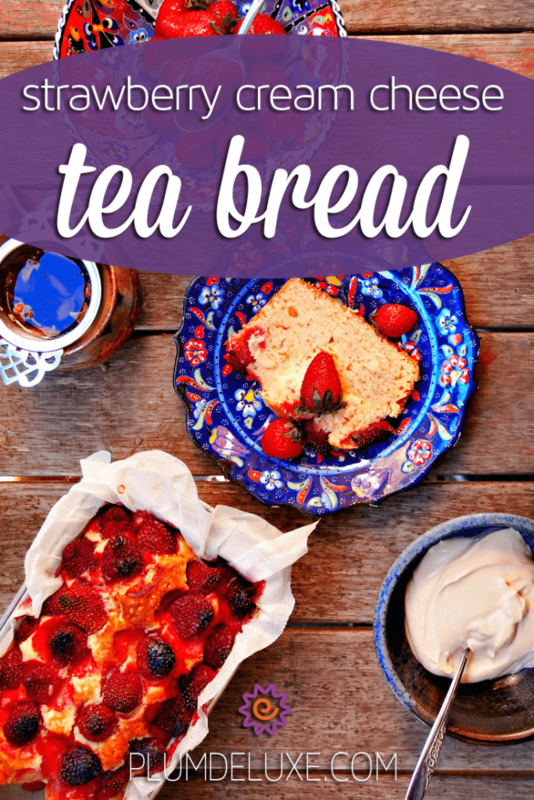 This tea bread is sweet enough with sugar and strawberries, so I chose a filling that is barely sweetened at all. Instead, the creamy richness and burst of almond flavoring provide a smooth, decadent counterpoint to the fragrant bread and tart berries. This bread is best served warm when the cream cheese filling is meltingly soft and the strawberries are plump and juicy. It’s nice toasted the next day, but be sure to toast it in the oven rather than the toaster, or you’ll have cream cheese filling dripping everywhere. I enjoy it in nice, thick slices served by itself or with a drizzle of strawberry syrup or a smear of strawberry jam. It goes down well with a hot cup of something. Coffee and hot chocolate are good, or you could try a warm slice with one of our fruity teas like Peach Bellini Herbal Tea, Gratitude Blend strawberry Earl Grey, or Garden Grove cherry-jasmine green tea. For the filling: In medium bowl, mix together cream cheese, egg, almond extract, and powdered sugar until smooth. Set aside. In another medium bowl, stir together flour, cinnamon, baking powder, and salt. Set aside. In large bowl, place butter and sugar. Beat on high until fluffy and pale, about 3-4 minutes. Mix in egg, milk, vanilla, and almond extract until smooth. Add in flour mixture, stirring gently until mixed. Line loaf pan with parchment paper. Pour half of batter into pan and spread evenly. Use spoon to spread cream cheese mixture over batter. Add remaining batter and spread evenly. Press strawberries hull side-down into top of batter. Bake for 60-70 minutes until cake is browned nicely and firm to the touch. Remove from oven and let cool 20-30 minutes. Cut in thick slices and serve warm or cold.